If your only experience with garlic has been the small white bulbs that you buy at the grocery store, you’re about to enter a brave new world of gourmet garlic names, amazing flavors, and delicious recipes. Bite into a Chesnok Red and enjoy its sweet, spicy flavor…enjoy the robust flavor and subtle heat of Inchelium Red…step up to the bold Spanish Roja and see if you can handle the heat! You can buy garlic seed stock and start growing your own amazing gourmet garlic or get immediate gratification and garlicky awesomeness by buying culinary garlic perfect for mincing and roasting. Chefs are increasingly turning to gourmet garlic for its unique tastes and flavors, using them in soups, sauces, stir fries, marinades, rubs, and other recipes. 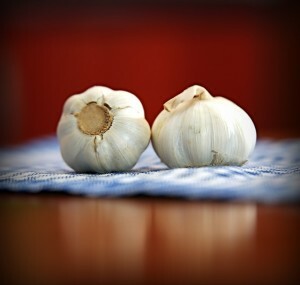 The combinations are endless as each garlic brings its own special taste, with the flavor often mellowing and changing depending on how it is prepared and cooked. The taste of each garlic variety also changes as it ages after being harvested, with bold spiciness often mellowing into rich, robust flavor as it matures. There are over 600 named varieties of Allium sativum (aka garlic) being cultivated today by commercial growers, gardeners, and fans around the world. New varieties are being discovered constantly around the world, including some heirloom garlic varieties that have been grown regionally for centuries. 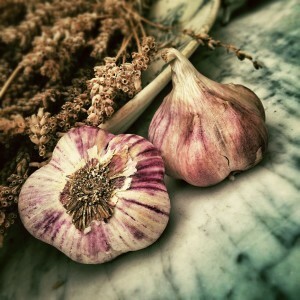 Aside from the taste and flavor, gourmet garlic is growing in popularity due to medicinal usage and health benefits. It has been used for thousands of years by many different cultures as a natural remedy for a host of illnesses. Garlic may help treat a wide range of illnesses and infections. Studies have shown garlic to be effective in lowering blood pressure, treating hypertension, regulating blood sugar, and treating colds and coughs. Garlic has shown promise in recent years for treating staph/MRSA infections, as it has antibacterial properties and its complex chemical nature makes it difficult for MRSA to adapt to it. Research into the health benefits of garlic is still ongoing and be wary of some of the garlic pills and powders on the market. The process of manufacturing many pills and powders destroys the active compounds behind possible health benefits. Eating fresh chopped garlic — and the allicin it contains — is by far the best way to take advantage of any health benefits it may provide. Garlic primarily reproduces asexually which means it has undergone absolutely no modification or hybridization; many types do produce a stalk (called a scape) and a flower but seeds are almost never naturally viable for garlic today. A raised growing bed with Music porcelain garlic. Growing gourmet garlic from a clove or bulbil produces a genetic clone to the parent so any differences in varieties are solely due to natural mutations over time and genetic drift. That means there no GMOs or patented seed hybrids in the garlic world; some heirloom garlics have been grown and treasured for centuries, handed down from generation to generation. It is very easy to grow and varieties are available for nearly every growing zone, although care should be taken when selecting the right garlic varieties to grow in your area. Garlic can be grown indoors in containers, in raised beds, and as a field crop. It is naturally resistant to many diseases and does not need to be protected from deer or birds. 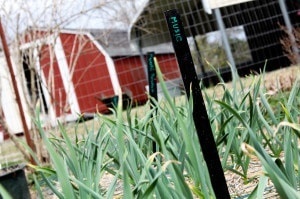 Garlic is tolerant of a wide range of growing conditions, ranging from porcelain varieties that thrive in very cold northern climates to Creole garlics that love the heat and humidity of southern climes. The purpose of this site is two-fold: we’re planning to sell our own gourmet garlic in Summer 2015 but we also want to help spread the word about the amazing diversity in the world of garlic. 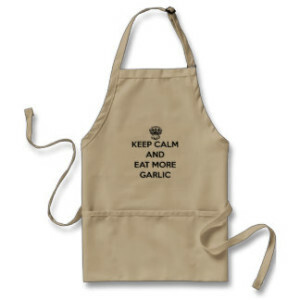 You’ll find a wide range of resources here, from a master list of all the types of garlic to recipes to growing tips and much, much more, as well as news and updates from our own leap into the world of garlic growing. 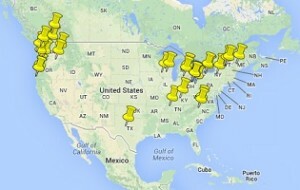 Check out our garlic growers list! Like other heirloom crops, garlic has seen a renaissance in the last ten years, especially as more varieties have been re-discovered and brought to the U.S. and Canada from other regions. 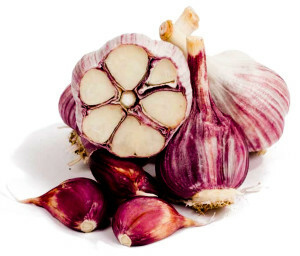 The name of many different varieties speak to garlic’s colorful history and interesting past such as Kettle River Giant, Inchelium Red, Thermadrone, Red Janice, Asian Tempest, and Ajo Rojo. Finding gourmet garlic at your local farmers market can still be hit or miss but it continues to grow in popularity. It’s a very easy crop to grow organically, helping it quickly find traction among organic growers and smaller farms throughout North America. An increasing amount of medical research is being done on garlic aside from treating hypertension, including promising results using garlic to prevent some gastrointestinal and colon cancers, treating lung cancer, and suppressing tumor growth. Few clinical trials have been done but population studies suggest that a 50%+ reduction in some groups eating garlic regularly for colon cancer, pancreatic cancer, and stomach cancer. Garlic has about 4 calories per clove, so no worries there if you’re counting calories. It is a vegetable and its closest relatives in the plant world include onions, shallots, leeks, and chives. The type species for garlic and other alliums is Allium sativum, with about 750 species recognized under Allium. Wild garlic is actually a separate species from garlic that is typically grown and eaten, with wild garlic classified as Allium ursinum, Allium vineale, Allium drummondii, Allium canadense, and Allium triquetrum. Elephant garlic (Allium ampeloprasum) also isn’t a true garlic and is instead a leek variant — although the appearance and flavor is closer to a garlic than a leek. We currently grow about a dozen varieties of gourmet garlic on our small Tennessee farm, where we also make a range of handmade soaps, beard balm, and other natural products.